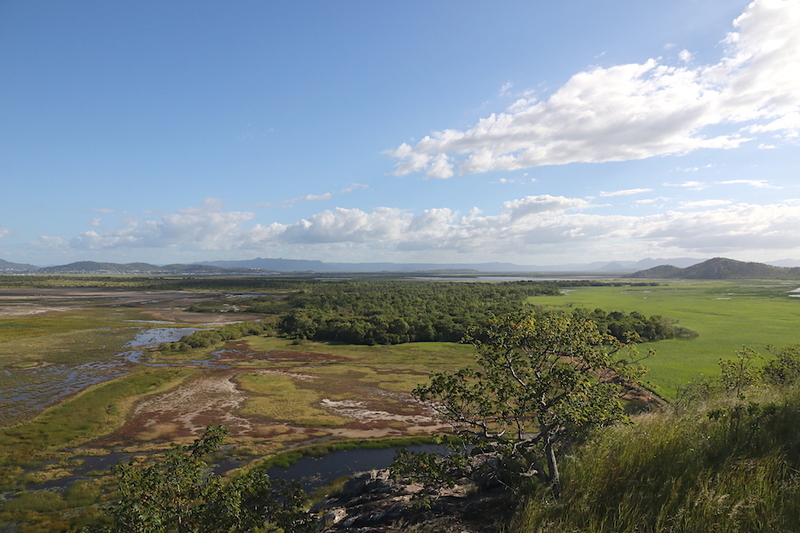 Walking back down the hill for Tegoora Rock lookout (previous post) I spotted a green-ant nest with – surprisingly – a butterfly perched on it. Living dangerously, surely? Perhaps not. I had vague memories vague of mutually beneficial partnerships between butterflies and ants so I looked them up when I got home. The butterfly guide books (and sites) generally just note the “attendant ant” species and the food plants, e.g. Citrus Ants ( Oecophylla smaragdina, FORMICINAE ). Barbed Wire Bush ( Smilax australis , SMILACACEAE ). The Caterpillars pupate on the stems of the food plant, often in groups, head down. 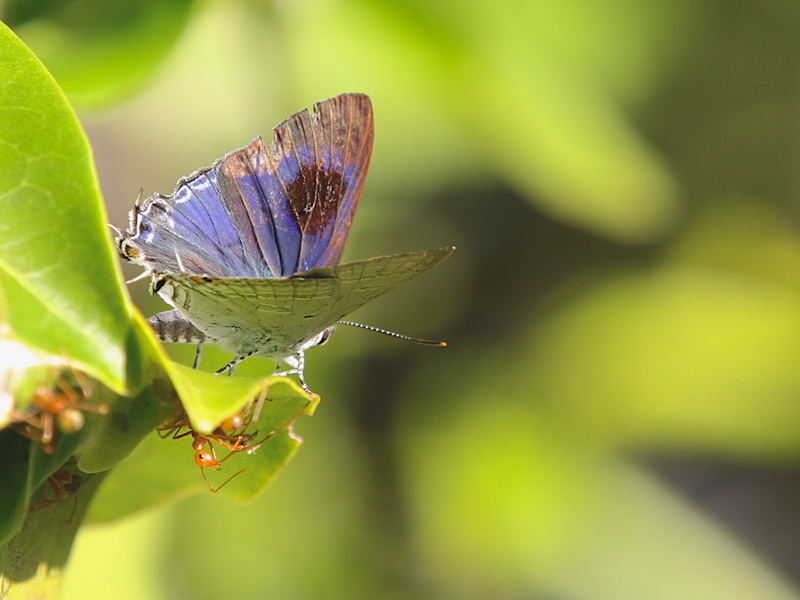 The butterfly family Lycaenidae (including the Riodinidae) contains an estimated 30% of all butterfly species and exhibits a diverse array of life history strategies. The early stages [i.e. caterpillars] of most lycaenids associate with ants to varying degrees, ranging from casual facultative coexistence [i.e. they help each other but don’t need each other] through to obligate association where the long-term survival of the butterfly is dependent on the presence of its attendant ants. Attendant ants guard the butterflies against predators and parasites during their vulnerable period of larval growth and pupation. The caterpillars, in return, reward the ants by providing attractive secretions from specialized glands in their cuticle. That’s the introduction to a thesis, Ant Association and Speciation in Lycaenidae (Lepidoptera): Consequences of Novel Adaptations and Pleistocene Climate Changes, by Rodney Eastwood (pdf here). The thesis itself is concerned with tracing associations between ant species, the butterflies they care for, and the butterflies’ host plants; I know a couple of people who would enjoy it but the general idea is enough for most of us. Nearly 80% of the lycaenid species in Australia, for which the early stages are known, are recorded associating with ants and half of these are obligately ant-associated. 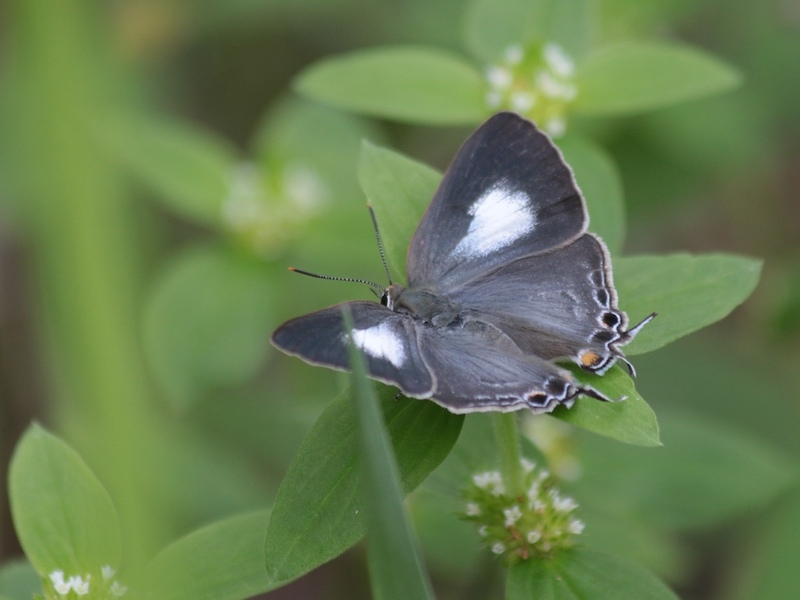 … Lycaenids are recorded with five ant subfamilies … All ant species that tend lycaenids spend at least some portion of their time foraging on vegetation to collect plant and insect nectar. As I said in an earlier post, male butterflies often hang around their caterpillars’ food plants waiting for females to come and lay eggs, and it is quite likely that the one I photographed is doing just that. And if the ants recognise the caterpillars through chemical cues, the adult probably produces the same cues and will be safe on their nest. Finally, here is the female of the species, which I photographed at the other end of the Common a few years ago. The Town Common wetlands still have a fair bit of open water, two months after our big floods, but it is back to normal levels for this time of year – if there is such a thing as “normal” in our wildly variable climate, that is. Between the floods and the resumption of regular service on Green Path we received an email via the Contact page. The observations in it were so good that I asked permission to publish it, and here’s the result. I have used italics for my words to keep them separate; apart from that, I’ve done just a tiny bit of editing for consistency and brevity, and added links where appropriate. My name is Ray and my wife (Judy) and I are retired and live in Annandale, backed onto the creek that runs from the Army base under the A1 and the “Richard I Bong” Bridge on Macarthur Drive. Got your email address from the Green Path website and you seemed quite experienced in birdlife. Thought you might be able to enlighten us – if you have time. 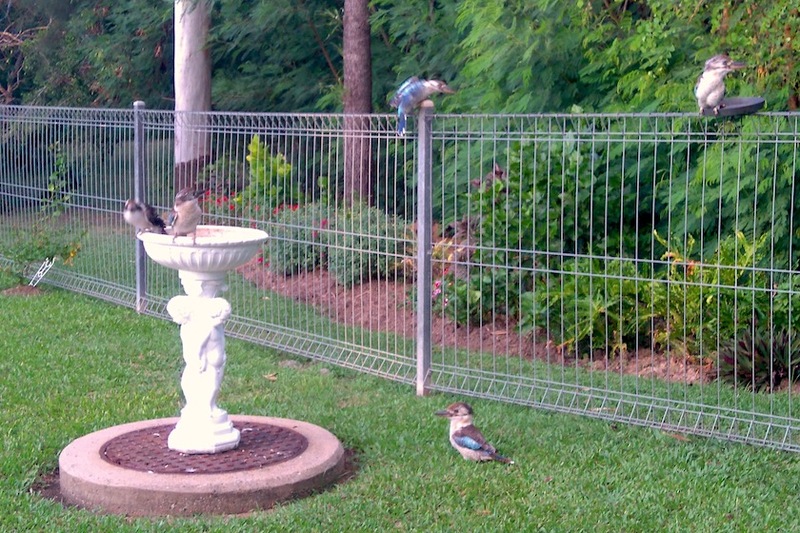 We have been visited lately by four Blue-winged and one Laughing Kookaburras (see pics attached).